Every successful national or global operation abides by a set of documents; these are sometimes called control forms (as in the United States CFR system). Everything is documented, all the way down to each request for a box of pencils. 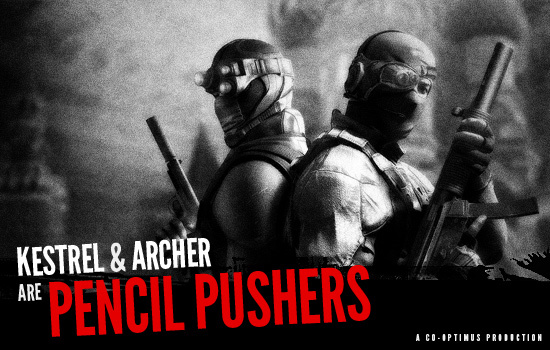 After playing a full co-op mission of Splinter Cell: Conviction together, Mike and Jim wondered what a mission file full of control forms would look like, as penned by operatives Archer and Kestrel. What follows is an accurate picture of what our Nation’s top operatives REALLY think. Description: One lone guard, two trained operatives, and multiple means of elimination. Unfortunately, there is a communications gap here. I maneuvered onto the ceiling - via the water supply pipe - in order to engage the guard from above. Minimal mess, minimal noise. Archer instead chose to fire his suppressed weapon, striking the guard in the frontal left lobe. An opportunity and a bullet wasted. Guard was successfully eliminated without further incident. Preventative action required: Suggest re-evaluation of communications effectiveness. Description: I ran out of ammunition while double tapping every hostile that my squadmate neglected to engage. He cited lack of training in use of his standard-issue Sonar Goggles as an excuse for not noticing their presence. Solution: I need more ammo, and Kestrel needs to be sent back to Basic. Addendum: What kind of name is Kestrel, anyway? We’re ground operatives. Save that crap for those drunks in the Air Force. Description: During our facility exit we encountered a problem opening a simple door. Apparently a door needs to have space within the room to swing open, and will not open if someone is standing in front of it. Solution: Archer bashed the door apart with a swift kick. Suggest commendation once he finishes podiatric physical therapy. Preventative action required: In addition to arming us to the teeth in our munitions drops, perhaps you desk-jockeying knuckleheads could arrange to provide some rudimentary emergency care supplies in the (however unlikely) event that we suffer injuries in the field. Description: Our presence was compromised in the secret club, as explained in our debrief report. During the firefight I was injured. While waiting for Archer to arrive with the medical supplies, I observed that he was being fired upon by an enemy combatant behind the bar. I communicated the tango’s location, at which point he moved behind the bar, disarmed the assailant...and then proceeded to smash the man’s face into the bar. In a separate incident, Archer also severely burned an interrogation subject’s face on a cooking stove, after already extracting the needed information by closing a refrigerator door on his head. Preventative action required: Contact the Third Echelon psychiatrist, pronto. Description: During our infiltration of the secret club, my hapless compatriot managed to run headlong into a room full of hired goons and got himself shot. Though our training dictates that we “play dead” until a squadmate can provide support, Kestrel decided to get chatty and whine incessantly while I cleared the room out in an effective, admittedly brutal, method. Solution: Next time he questions my methods, I’ll conveniently “forget” to include the emergency defibrillator in my loadout.